With four connected computers, the K504E offers impressive levels of seamless communications even when connecting computers that are on different levels of security clearance and Internet access. The K504E utilizes unidirectional optical datadiodes which insulates all connections from any possible points of data leakage among peripherals. Also included is an auxiliary channel firewall, providing further protection from internal security weaknesses. Every K504E secure KVM switch is rigorously and extensively tested to ensure it will remain stalwart against any known form of KVM security attacks. The unit has been certified to meet EAL 4+ standards to assure it provides the highest level of security possible. The K504E is an essential tool for users challenged by frequent switching between isolated networks. This product resolves challenges of virtualization while adding additional security protections. The RDC (Remote Desktop Controller) port enables simple interface with the RDC controller. 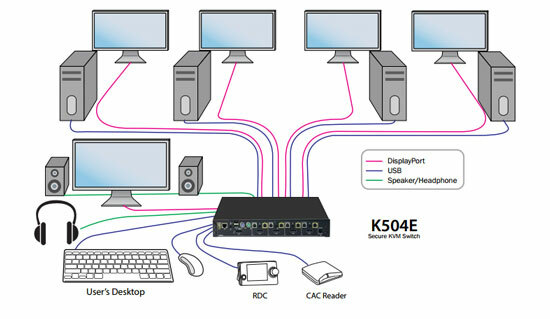 Using the K504E with RDC, users can control and monitor KVM functions remotely and securely. The K504E also features patented auxiliary channel firewall that designed to protect from DisplayPort internal security vulnerabilities.